Blackout Fabric. This type of shade fabric is designed to completely black out all exterior light for the highest amount of both daytime and nighttime privacy, complete glare control, UV elimination, and a notable reduction of the room's heat gain. Translucent Light Filtering Fabric. While this fabric still affords daytime and nighttime privacy (in varying degrees depending upon the exact style chosen), it also allows light to flow into the space. This soft filtration of natural light brightens your home without the negative impacts of sun glare and UV rays. This, in turn, also reduces your home's solar heat gain. Solar Screen Fabric. This is the ideal choice with its transparent qualities for those who don't want to compromise their views to the outside. Solar Fabrics are designed to filter natural light while also providing exceptional solar protection, glare control, and energy savings. 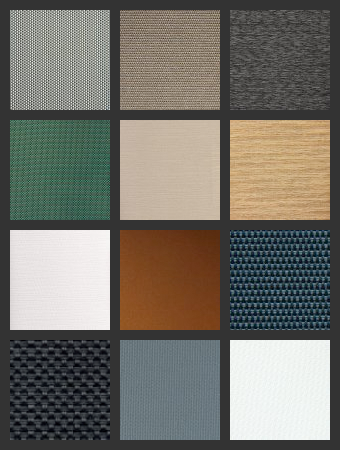 These fabrics provide daytime privacy, with varying degrees depending upon the fabric color and openness chosen. Light Colored Shades. Choosing a lighter color in our collection, such as White or Tan, allows more natural light to diffuse into a given room for a brighter interior environment, while also going further to reduce heat gain. Dark Colored Shades. The darker shades in our fabric offering, such as Black or Bronze, are designed to provide better glare reduction in addition to providing better view-through. Dual-Side Shades. These shades offer a 'best of both worlds' solution in which a light-colored exterior reflects heat energy while a dark-colored interior more effectively diffuses glare while also providing good visibility. The shades fabric density is also known as its openness factor. Shades are woven together with industry-specific threading. How open and large the gaps are between a specific's shade's weaving determines how much light is capable of filtering in. This openness is described in a ratio or percentage reflecting open space to material. For example, a shade with 3% openness is considered less open, or has a 'low openness factor'. This means its weaves are tighter and closer together with the impact of reducing the amount of light filtering through. Fabrics with Low (<9%) Openness are designed to enhance daytime and nighttime privacy. This means less visibility but better UV and solar glare protection. Fabrics with High (>9%) Openness enable greater visibility for enjoying exterior views. These are best for natural light filtration. To learn more about shades and for help in selecting the best fabric solution for your home, contact us today at 877-260-6110. We'll help you determine which fabrics have the right mix of attributes to meet your needs. You can also request a quote.